Also known as Velocity mics, ribbon microphones stand in a class of their own. These are the only mics that are neither dynamic nor condenser. However, ribbon microphones are pretty similar to dynamic mics only that they use ultra-thin aluminum plates suspended between 2 magnetic poles. These plates act as both the diaphragm and the conductor. Their unique mechanism offers an unmatched and near-natural response to sounds that is ideal for realistic music recording. The best ribbon microphones are known for their outstanding brass and string instruments recordings. Again, they can also be used with percussion and other instruments that emit high sounds. They are also ideal for electric guitars as well as vocals. Join us as we unravel 6 of the best ribbon microphones for 2017. Ribbon microphones are darn expensive. This is due to their unmatched performance in recording vocals and instruments with a velvety smoothness and clarity. Some top-notch ribbon mics like the Royer Labs R-121 can set you over 1 grand back. As such, they’re usually common with professional studios that have a higher hardware budget. However, there still exists cheap ribbon microphones that offer the silky and modern sound associated with these mics. Here are the 3 best ribbon microphones under 500 bucks. Finding a good ribbon microphone under 100 isn’t something that happens every other day. As such, the MXL R144 is the best bargain for you if you need near-professional performance without costing you the earth. The R144 features a cool design with a metallic construction and purple and chrome finish. It measures 1.85 in. x 6.75 inches and weighs around 0.85 lbs. These measurements make its placement and handling easy and safe. Just below the chrome-finished wire mesh grill is a letter-8 inscription. This indicates the microphones figure-8 polar pattern. This directionality doubled with its 1.8-micron aluminum ribbon element ‘hears’ sounds from the front and back of the microphone with equal sensitivity. Again, it rejects most of the signals coming 900 off access. R144’s stand out features include its high SPL capability of up to 130dB with only 0.1% distortion and its -56dB sensitivity. This makes it a favorite choice for the best ribbon microphone for electric guitars and horns. It also offers vocal records which are smooth and crisp true. To seal the deal, you receive a not-so-bad shock mount to aid in better placement of the mic and a padded carrying case to keep the ribbon protected when the mic is not in use. You also get a cleaning cloth and a manual and application guide. In case you’re hunting for the best ribbon microphone for vocals to spend your 200 bucks on, I would strongly recommend the Golden Age Project R1 MK2. Let’s face it. 200 dollars will surely dent your wallet. 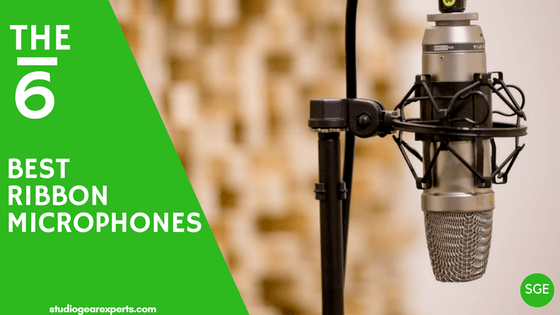 As such, you need to know that you’re investing in a quality product that will bring satisfaction and improve your home recording studio, right? That’s what Golden Age promises and offers. True to its name, this ribbon mic offers your vocals and instrument records a vintage and classic touch that is synonymous with the sultry tones of the early 1940s and 1950s. Its records are beautifully warm and standout in any mix. Golden Age R1 MK2 is 2 times pricier than the MXL R144 above. However, the MK2 ships with the XLR cable that lacks in the MXL R144 package. Again, MK2 has a 2-micron thick ribbon which withstands high SPL sounds of up to 160Db (the highest in this list). As such, you’ll be able to record different live sound applications including vocals, horns, orchestras, strings, acoustic instruments, and choral groups with precision and classic sound clarity. However, like with any other ribbon mic, you’ll need a preamp to use it. On the upside, Golden Age R1 MK2 is compatible with different preamps and mixers. Avantone CR-14 flaunts an unusual retro-design rectangular shape with Cabernet Wine-Red finish and an elongated black grill. But its real deal is exhibited in its inner assembly parts and features. The CR-14 boasts 2 low-mass ribbon elements that increase its sensitivity and output level. This dual-ribbon element design is similar with other high-end mics including ShuaiYin SYR-50. The essence of the 2 ribbon elements is to increase both the sensitivity and output level of the mic. This element also contributes to this mic’s 145dB of SPL handling capability when recording studio instruments and vocals. It also leads to reduced residual noise. However, due to its excellent sensitivity, you’ll require an external pop filter to help reduce the distortions caused by internal blasts and baffling. Worth pointing out, Avantone CR-14 employs the figure-8 polar pattern. However, its front and rear side produce varying sound results. As such, it’s advisable not to use it for mid-side applications. This ribbon microphone performs well with guitar amps, brass, acoustic guitar, violin, cello, flute and vocals among other applications. If you’ve listened to the way, the drums come out in John Bonham's ‘’﻿﻿When the Levee Breaks,’’ you already know how Beyerdynamic M160 sounds. This mic is also Jimi Hendrix’s best microphone for guitars. Do I need to say more about it? This is the only ribbon microphone on this list that looks like a ‘real’ microphone. Again it’s the only microphone that we’ve covered here with hyper-cardioid directionality- all others use figure-8 polar pattern. The thing with this pattern is that you can use the mic in about any application. Beyer recommends it for miking various string instruments including violins, cellos, and violas. You can also use it for guitars, pianos, saxophones, hi-hats, toms, tambourine and a couple of other percussive instruments. The Beyerdynamic M160 is fitted with a dual-ribbon design. This mechanism doubled with its hyper-cardioid directionality offers you classic sound quality with reduced off-axis sounds. Its extended 40Hz-20kHz frequency range adds to its versatility while its 1000-ohms of load impedance enables high SPL recording capabilities. Moreover, for the price, you get 2 gold plated male to female cables and a professional microphone stand and boom- Quite a good deal. Rode NTR is a well-built ribbon microphone featuring an explicit design with a matte black finish that makes it look great in your studio. At a glance, given that the wire grille is superbly easy to see through, you’ll tell that this beast is a great investment. It’s designed to offer nothing but value to any professional or home recording studio. About performance, Rode NTR is equipped with a highly sensitive 1.8-micron ribbon element. This element is suspended and held separate from the rest of the microphone’s body by an internal shock mounting system. This design coupled with the super sensitive ribbon element makes the NTR one of the best ribbon microphones for studio recording. Worth mentioning, when not in use, the internal components are secured in place by a travel screw. Like other ribbon mics, the NTR uses figure-8 directionality. Uniquely, it boasts a solid frame in the capsule rejection zone that aids in putting all unwanted noises at bay. Again, it has a naturally flat 20Hz-20 kHz frequency range. Like other users, you’ll be awed by its ability to handle low-frequency projects like no other ribbon mic. It also has an extended high-frequency range that makes it a real deal when recording acoustic guitars and percussion instruments. No list of the best ribbon microphone reviews would be complete with a unit or 2 from Royer. Royer Labs (an American-based Company) is widely known for its ribbon mics and has scooped several awards including the TEC and Technical Grammy Awards. The R-121 was Royer Lab’s first ribbon microphone. Though quite pricey, this mic has been musician’s favorite since its birth presumably because of its extreme versatility and flexibility. A glance at some of its unique features reveals 135dB of maximum SPL handling capability and 30kHz-15kHz frequency range. Uniquely, this is the only mic in a pool of other ribbon microphones whose ribbon isn’t to easy to damage even when placed on high-volume instruments (we don’t recommend this with other mics mentioned above). The ribbon itself is 2.5 microns and has been professionally crafted from aluminum. The ribbon coupled with the mics -50 dBv sensitivity offers you a flat and well-balanced response. Its low end is nicely articulated and never gets boomy. The mids feel quite realistic, and the highs are well defined and sound natural. Simply put, the Royer Labs ribbon microphone is a studio workhorse that can be put in place in almost any project. While most of its users view it as the best ribbon microphone for electric guitars, you can use it for vocals, trumpets, deep kick drums, flutes, and vocals too. If you’re looking for the ideal mics to bring out the best recordings out of your musical instruments and vocals, you owe it to yourself to hunt for the best ribbon microphone. These mics have vintage sounds that add warm and realistic tones to your digital recordings. Though pricier than the condenser mics, they always pay for themselves with their vast flexibility and versatility.